In 2000 the MoD committed to 25 x Airbus A400M (later reduced to 22) to meet the Future Transport Aircraft (FTA) requirement for an air lift capability to replace the remaining Hercules C-130K and C-130J fleet. The A400 is a collaborative programme involving eight European nations (Germany, France, Turkey, Spain, Portugal, Belgium, Luxembourg and United Kingdom), procuring a total of 174 aircraft. The expected UK project cost is some £3.2 billion for 22 aircraft and the first aircraft will be delivered to the RAF in 2014 with an in-service date of March 2015. Full Operating Capability (FOC) should be possible in 2018 when 12 aircraft should be in service. 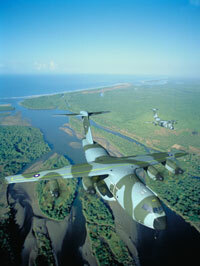 The A400M will provide tactical and strategic mobility to all three Services. Atlas’s capabilities will enable the aircraft to operate from well established airfields and semi-prepared rough landing areas in extreme climates and all weather by day and night; to carry a variety of vehicles and other equipment, freight, and troops over extended ranges; to be capable of air dropping paratroops and equipment; and to be capable of being unloaded with the minimum of ground handling equipment. Atlas will also meet a requirement for an airlift capability to move large single items such as attack helicopters and some Royal Engineers’ equipment. In short, Atlas is capable of transporting 32 tonnes of cargo over a range of 4,500 km. 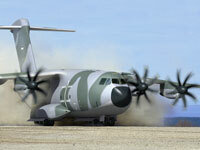 Airbus Military SL of Madrid, a subsidiary of Airbus Industrie, is responsible for management of the whole of the A400M programme. Companies involved in the programme are. BAE Systems (UK), EADS (Germany, France and Spain), Flabel (Belgium) and Tusas Aerospace Industries (Turkey). It now looks likely that the RAF will probably retain its C-17s, and will operate a mixed transport fleet comprising the C-130J, A-400 Atlas and C-17 until at least the end of the decade. Orders for other nations include Germany 53; France 50; Spain 27; Belgium 7; Turkey 10; Luxembourg 1 and Malaysia 4.